This was another episode where the point of view character isn’t Natsume, but it definitely works. Nishimura and Kitamoto have been staple characters for this series from the early going. 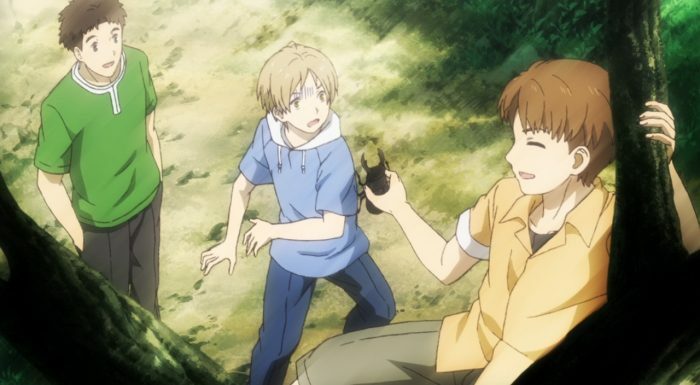 It is nice that they get an episode that focuses on them and how they became friends with Natsume. 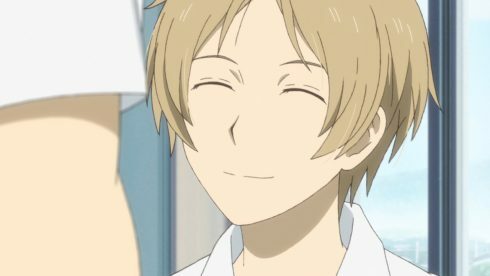 It also shows how they do have some experiences with the weirdness that exists in Natsume’s life, but still considers him a precious friend. Honestly, that makes sense to me. You can’t hang out with Natsume on a regular basis and never notice something weird going on. 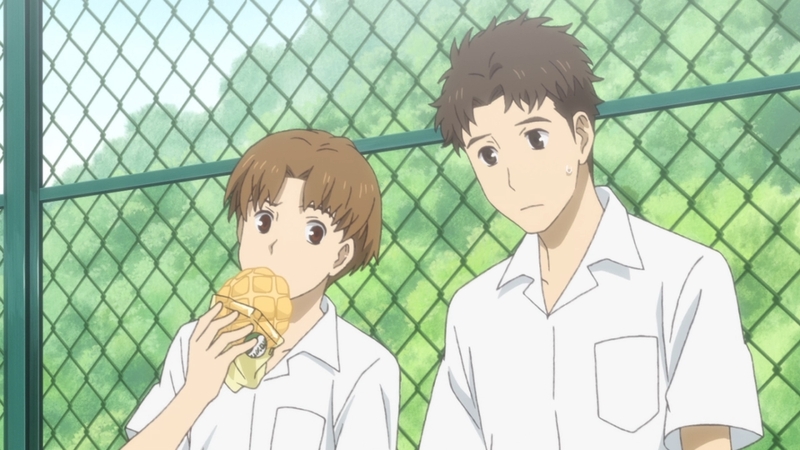 These two are the staple ‘normal friends’ in Natsume’s life and it was simply nice to get some understanding on their lives. It is just a snippet of the kind of issues they have going on themselves, but it fleshes them out nicely. They aren’t just Natsume’s friends, they are people. 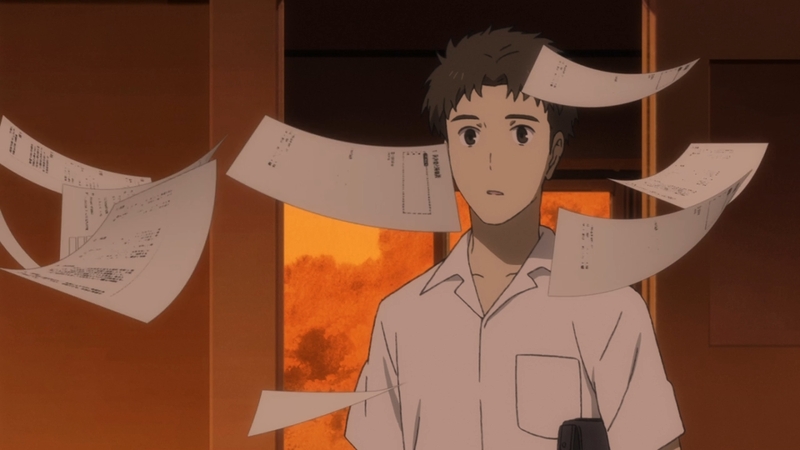 It is kind of interesting to look back on S1 Natsume. Really shows how far he’s come as a character. He really was a lonely person back then. Putting up a fake smile had become second nature for Natsume. There was almost a requirement for him to put a distance between himself and others. No telling when he might see a youkai or have to start running away. And certainly Natsume knew very well by this point in time that no one would believe him if he talked about what he was seeing so it was better to just keep his distance. That he spent most of the time alone or sleeping just makes sense. He was probably exhausted in a lot of ways from constantly being on the run. But I think he also slept simply so he couldn’t see any youkai at school. We know why it meant so much to Natsume to have Nishimura approach him and start building that friendship. 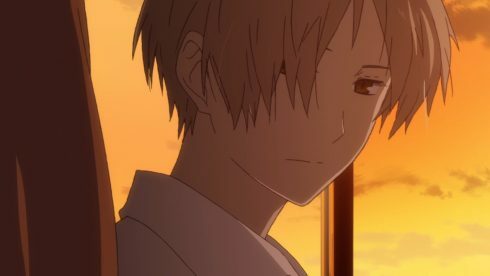 While Natsume distanced himself from others it isn’t as if he craves isolation. But we could also see how guarded Natsume really was back then. No doubt when Nishimura found Natsume it was after he had been fleeing from a youkai. While I think he really appreciated someone caring about him and inviting him to his home…he knew the dangers. The youaki likely did track him down and he had to run for it. 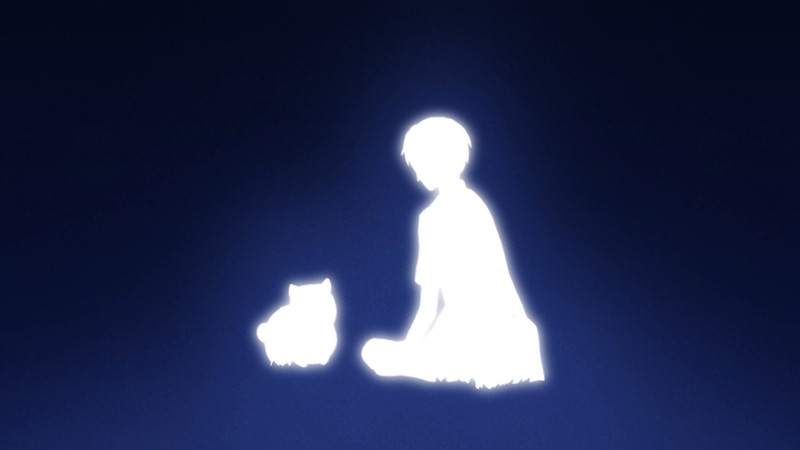 Soon after that Natsume likely met Nyanko-Sensei and things started to truly turn around for him. He had a means to start holding his ground and find his place. In a lot of ways I just liked seeing how these guys got involved with Natsume. Nishimura was definitely dealing with youkai problems and Natsume was able to help him out somewhat secretly. And you can just imagine the panic for Natsume in trying to deal with that youkai while Kitamoto was there at the school with him. But despite how weird things could get these guys understand what kind of person Natsume is. That youkai lead to Nishimura blowing up at Natsume, but even that outburst came from a place of caring. He didn’t like seeing Natsume isolated as he was and wanted Natsume to rely on him. I really did like Nishimura’s segment of the episode. He sometimes looks like a silly character, but he is a good person at his core. Certainly I think people can relate to him having a sometimes good and sometimes bad relationship with his brother. That sometimes he can clash with his mother and say a bit too much. And he did just want to have a nice time with Natsume. 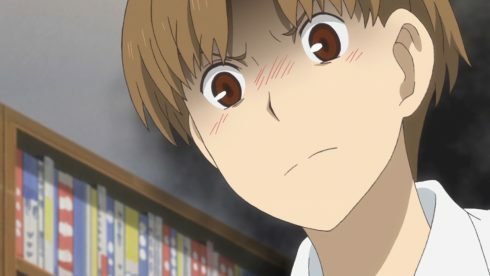 Truly Nishimura felt bad and was worried that talking about his family relationships might have made Natsume feel bad. He along with Kitamoto is part of the normal core for Natsume’s life. The Fujiwaras represent a normal family and these two a normal friendship. Natsume have friends who understand his unusual life, but having friends mostly unaware of that is refreshing for him as well. I certainly feel for Kitamoto and his situation. He has a lot more going on than I might have thought before this episode. While Nishimura seemed like the silly one obsessed with girls, Kitamoto just seemed like a stable person. But he’s also a normal guy who can take his sister making his lunches for granted or struggle with deciding his future. Having a father who has less than stellar health is a stress factor. Kitamoto does have to balance his choices between going to college or finding a job to help support his family. Being the eldest child has a burden to it. And it makes sense for him to also be worried about Natsume. He can feel that Natsume has more going on than he knows and worries about him disappearing. It really had to be a relief to know how important this town is to Natsume. This was just a really strong episode. 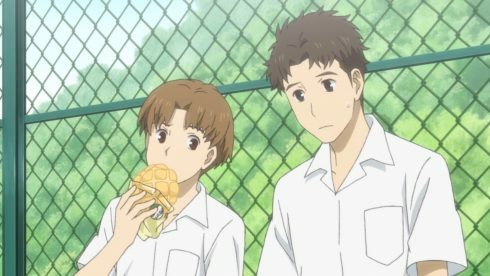 It makes sense that both these guys have had unusual experiences and yet similar to the Fujiwara couple they trust Natsume. And I also liked hearing from Natsume himself how he really doesn’t want to go anywhere else. He finally found his paradise in this place and would never want to leave it. Sometimes it can be nice to see how others view Natsume and not just how he views the situations he gets into. These guys can’t see what Natsume can, but they are incredibly important to him. I don’t know if there will be a time when Natsume opens up to these two about what he can see. But no matter if he does or doesn’t, these two will be there for him now and in the future.